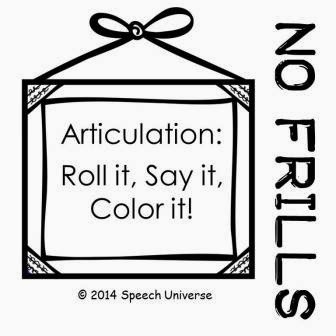 No Frills Articulation: Roll it, Say it, Color it! I am really excited to show you my newest addition to the No Frills Articulation line. No Frills Articulation: Roll it, Say it, Color it! 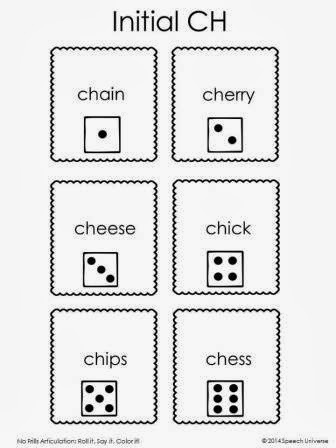 This set of worksheets is used with dice and crayons/markers to motivate students to practice a variety of sounds in all positions of words. The sounds included are: CH, F, G, K, L, R, S, SH, TH, V, and Z. All sounds are presented in the initial, medial, and final positions of words. 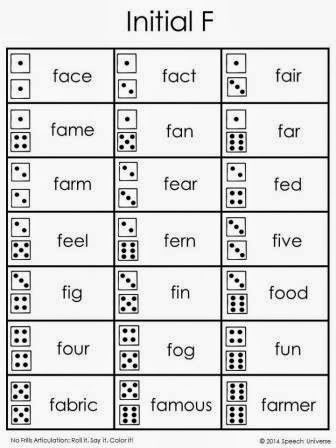 To use these worksheets, students roll one or two dice, and say the corresponding word. I like to have the students say the word the number of times that is on the dice. Then, students are able to color in the dice. Students can compete to see who colors in all of the dice first. You can also send these worksheets home as homework. My students love to color while practicing their articulation words, and these worksheets have been a great way to engage my students into really focusing on getting many trials in during their sessions. You can get this packet at my TpT store HERE. No Frills Articulation: Roll it, Say it, Color it! is also included in the No Frills Articulation Bundle. If you have previously purchased the No Frills Articulation Bundle, then great news! You already own this product! Just download the latest version of the bundle.